Aquaterra Energy and Plexus Holdings have announced they have developed a light weight, dual barrier HPHT riser system which can be deployed by a jack-up to enable a viable and cost-efficient alternative to semi-submersible installation for HPHT well operations. The companies presented the system to delegates attending the 11th World Oil HPHT Drilling and Completions Conference, which took place in Houston from 21 - 22 September, 2016. The technology is said to be suitable for shallow water depths up to 150 metres and harnesses the combined capabilities of the companys’ respective subsea technologies. 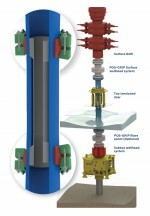 By uniting Aquaterra Energy’s HPHT riser system and Plexus’ POS-GRIP wellhead engineering technology, an inner riser string is installed inside a conventional high pressure riser (HPR) to span the gap between a dry surface BOP and a wet subsea tree. It provides full 20,000 psi capability and utilises all metal-to-metal gas tight seals on both the external and internal riser string. The system also eliminates the issues associated with surface wellhead developments that contain elastomeric seals, particularly those located between the mudline and surface.